Although most of my iPad time is spent browsing from the couch while watching television or reading in bed during evening hours, the device has also increasingly become part of my daily workflow at the desk. That’s particularly true for the larger iPad Pro, especially when paired with Logitech’s latest accessory. 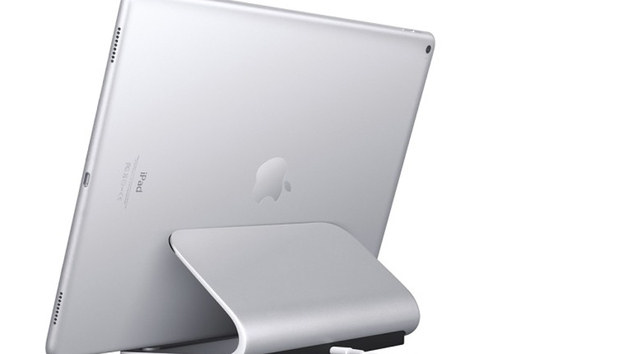 The Logi Base Charging Stand ($100 on Best Buy) is intended for iPads with a Smart Connector port, which at this writing is limited to 12.9-inch and 9.7-inch iPad Pro models. However, this aluminum stand features a plastic groove along the bottom capable of supporting most any iPad or slim tablet at a 70-degree viewing angle in portrait or landscape modes. At $100, Logi Base is expensive for a tablet stand, but it’s the Smart Connector built into the bottom that makes this accessory unique. There’s a Lightning port around back that attaches to the USB charging cable shipped with every iPad Pro (Logitech doesn’t include one in the box), enabling the device to be powered while cradled on the stand. Of course, this trick only works in landscape mode while the iPad Pro is attached along the left side, with the home button facing right. Because the Smart Connector is magnetized, the iPad Pro snaps into place with minimal effort as it’s being lowered onto the stand. Logitech recommends plugging the Lightning cable directly into an electrical outlet with a 12-watt power adapter rather than a USB port on your computer; Base worked perfectly with my four-port RAVPower USB wall charger. With no apps running the background, Logi Base charges up the iPad Pro in about seven hours. 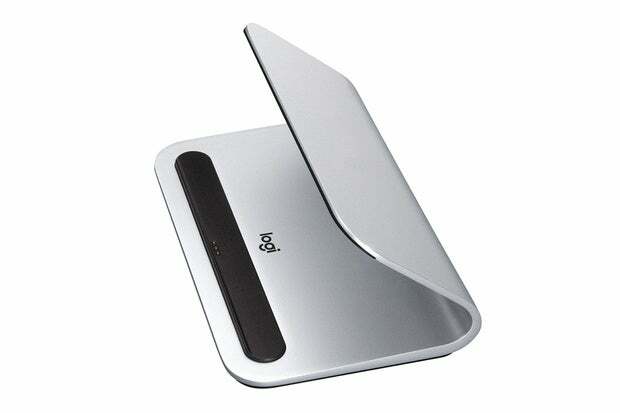 Logi Base is as attractive as it is rugged, measuring 3.23 inches tall, seven inches wide, and 4.48 inches deep. The stand weighs 12.6 ounces, and the angled support is exceptionally solid. I don’t think I could bend it if I wanted to, even when pushing hard on the top. The rubberized Base keeps the stand from sliding around on the desk. The stand works best with a naked iPad Pro, but some cases will also work. I own a generic version of Apple’s Smart Case, which works fine as long as the front flap is open and folded around the back. The case makes it a little more challenging to position correctly on the Smart Connector, but since it’s ready for use at all times this way, it’s a tradeoff I can live with. I’m a big fan of how Logitech’s latest products take advantage of the Apple Smart Connector (check out my review of the company’s Create Keyboard Case), and Logi Base is a welcome addition to the lineup. The only real downside is the cost—this accessory would be a steal at half the price, but if you can afford the convenience, it’s absolutely worth it. The Logi Base Charging Stand has found a permanent home on my desk. No more plugging in a Lightning cable to top off, and my iPad Pro is always ready for action from the perfect viewing angle.